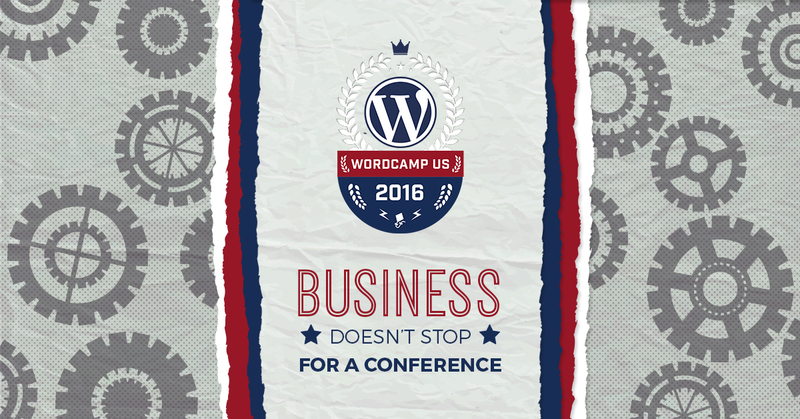 WordCamp US (WCUS) is the perfect event for a company retreat, but the business still needs to operate while we travel across the country. So, how do you spend days in another location, hours on a plane, and still work with product development, support, finance, and marketing without missing a beat? Here’s our game plan, by department. Development never sleeps. Just because we’re going to be at WCUS doesn’t mean our code sits in wait. That said, there will be fewer commits and a pull request (PR) might take a little longer while we are focusing on getting the most out of WCUS. We’ve planned for this slowdown within our milestones and have scheduled accordingly so there are no gotchas. That said, surprises can happen. If there’s a critical bug that’s discovered, rest assured we will be there to jump on it. We planned to all have laptops and WiFi at nearly every location throughout the week, so hotfixing won’t be a problem. I don’t anticipate this will come up at all, but you never know, and it’s always better to be safe than sorry. Support is a very “high touch” type of service — meaning we can’t really be multitasking while providing support to our customers. Since our whole team will be at WordCamp US it proves to be particularly challenging for us to provide the full Priority Support that we normally provide. Provide an excellent team-building experience that improves and enhances us as a Team and thereby improves our overall Support strength. Keep in communication with our customers to ensure their issues can be resolved even if somewhat slower. We’ll have prominent notices throughout the Support area informing Customers of our slower Support responses. We believe communication and properly setting expectations are vital to top quality Support team. All ticket confirmations will reflect our slower response times as well. Questions that can be answered easily without much additional troubleshooting should be able to continue to be resolved same-day. Questions that require a higher than normal amount of troubleshooting might have to be responded to in full after our return. Tuesday, December 6 and onward — Back to normal Support hours. Pending replies from the previous week will be addressed first. We are highly committed to your success with your website, your business, and your online donations. Feel free to reach out to us via our Contact Form or Support Form. Especially, if you have any concerns at all about the timing of our retreat and your website goals. Day-to-day finance is currently focused on meeting forecasted goals while ensuring each of our business positions remain strong and healthy. I completed forecasts for the coming 18 months ahead in early Q4 so I’m well-prepared for business travel. Even while at WordCamp US, I’ll be monitoring our average job size, advertising cash flow, and our daily revenues against planned monthly goals. This year there have been several key activities that resulted in our business outperforming its monthly forecasted revenue, while also increasing expenses. One of those activities are local WordCamps. Though we are not a sponsor of WCUS (we are sponsoring the Post Status Publish event), I project unplanned growth from the week in Philadelphia. I also plan, buy, and manage the advertising campaigns, so there are several several paid Twitter and Facebook social campaigns continuing while the team is at WCUS. We’ve been running a WordCamp US campaign for a few weeks and will continue our WCUS Speaker feature series. Our head of Support, Matt Cromwell, recently gave a knockout presentation on SSL, so we’ll be promoting that to our WordPress and Cause audiences. Finally, we’ll continue with our WordCamp-centric, “Happy WordCamping” Campaign, targeting the hashtag #WCUS. These ad dollars will extend our reach beyond organic audiences by upwards of five times and will positively impact the business in conjunction with WCUS. The good thing about marketing is that can be adjusted, planned, and implemented ahead of time. Also, we can adjust our goals. During normal times, we publish four pieces of content between our two main websites, WordImpress and Give. But for this week, we reduced our goal to two posts instead of four. We also plan ahead. For our editorial calendar, we plan to publish this post, for example, on Monday, November 28, but we are writing it November 18. Social media monitoring is easily accomplished during travel by using my iPhone. This is when it’s good to switch planes as opposed to a direct flight, because I’ll be able to check Twitter and Facebook while waiting for the next flight. If my flight has WiFi, even better! I will also bring my MacBook to schedule tweets, manage emails, and, of course, live tweet during the WordCamp US sessions.